Okay, can we just stop and consider that beautifully wrong title? I know it’s probably supposed to signify that it’s an “UFO” but only the way she sees it. But wouldn’t it be way more fun if it was meant to be like BAM UFO IN YOUR FACE. A girl can dream. UFO in Her Eyes is more a collection of documents and interviews rather than a narrated novel. This means there are only about two or three small chapters with actual running text, and the others are interview transcripts. Despite this rather abrupt form, I think Ms Guo did an amazing job in creating the characters. Even though we only ever see them speak, and never act, I felt like I knew the characters of Silver Hill. There is a progressive line throughout the book, and I was quite impressed with how this collection of scraps of text manage to convey a story. The book holds a political message, especially on how the way China modernises destroys some people’s lives. I feel the message was rather ambivalent though, because the people of Silver Hill lived in extreme poverty before modernization. Neither the near medieval way of living, nor the industry ridden modern one is perfect. There are some references to important happenings in Chinese history, but I feel those could have been worked out more. 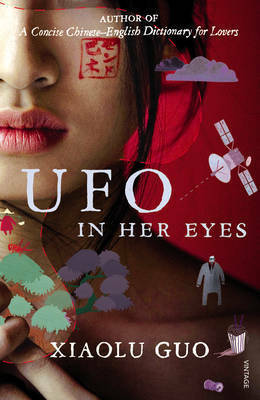 Although UFO in Her Eyes was a good book, and one that made me think about what’s happening in China right now, I felt as if it was missing something to make it truly great. It interested me enough to check out other books by this author though.